Top 12 Things Bands or Artists Should Not Do at Gigs! Just don't do it if you want to be rehired! Having over 35 years experience of playing in bands and musical groups all over the Northern Midwest and all over the East & West Caribbean (cruise ship), I have learned and experienced what to do and not do being a working musician. It really does not matter the type of gig that it is. I've done everything from church gigs, country clubs, theater/auditoriums, schools, bars, clubs, restaurants, weddings, wedding receptions, outdoor festivals, opening acts for pro touring groups, live radio and TV shows, and a three and a half month cruise ship gig. All these were different types of bands or groups with different styles of music. With each, several things come into play that these music situations have in common, things you should not do if you want to be taken seriously as a professional entertainer. I have, from my experience, narrowed down what could be a list of 100 things to the "Top 12 Things Bands or Artist Should Not Do At Gigs!" Most of these things I have witnessed and experienced at local bar/club type gigs, although I have opened for bigger shows for famous touring artists such as Robin Trower, Bad Finger, John Schlitt (Former Head East/Petra Singer), Saigon Kick, and top-rated Kiss tribute band Strutter. Unless there are unforeseen circumstances or situations beyond your control, there are never any good excuses to show up late or miss a scheduled show. I had to fire a drummer once on the spot after he showed late up to a very important Country Club gig paying top money. I was fortunate enough to be able to get ahold of a drummer friend I had played with many times before at the last minute to cover for him. The hired drummer in the band showed up five minutes before show time. He was drunk and not dressed to play. His excuse was that he got lost and couldn't find the place. I had given out detailed instructions with directions and maps weeks before and asked everybody, "if you are in doubt where this place is, take time to go find it." I had to argue with him in the parking lot as he cussed me out as I fired him. We started on time without drums as a bass, and only a guitar vocal trio until the replacement drummer showed up before the second set. In the end, we hired the replacement drummer to fill the rest of the shows we had booked for the rest of the year. "Just don't do it if you want to be rehired!" This mostly concerns local bands and artists that have not hit the big time or are new to the scene and have not built up a fan base yet. Sure, the club or venue will promise you "exposure"... but in the 35 years of playing I have never had a gig of any kind give me the exposure needed to: #1 not have a day job or side hustle, or #2 sign me to a major record label or major world tour! Your time, talent, and equipment are always worth something. Playing for free, even if you have no following, makes you look desperate and unprofessional. I understand if you are young and inexperienced and trying to get your first gig to break into the "scene," then maybe a one-time free slot would be worth it, as long as the place or venue is known for having good crowds, artists who tend to pick up a following, they like you, and they give you future gigs. But even with that said, you are worth something! The club/venue should at least cover your expenses and cost for you to be there. Possibly offer food and travel cost. I won't bring up playing open jams and open mic nights, which are usually free. This has also hurt the "paid music scene" in every town, all over the country. That's for another topic. "Just don't do it if you want to be hired!" It's a good thing to interact with your audience verbally. I have been to concerts with big name artists (Eric Clapton comes to mind) in which they hardly said two words to the audience. He just played his songs and the show was done. I remember leaving feeling a little put off and just not loved. On the other hand, I've been to concerts where the artist, in between songs, just talked and talked and talked about self indulgent stuff and sometimes rambled on about nothing in particular. And I've been to local shows of cover bands or artists that talk too much or joke around too much in between songs. Having a mature balance and understanding of who your audience is and the situation you are playing goes a long way. Fun, quick-witted bantering is always great with audiences as long as it's not offensive or long and boring. "Just don't do it if you want to be rehired!" This leads into the next topic. A lot of cases, it seems to be most rock, rap, or hard rock bands I've seen do this, but not always. Yes we get you are a "rock star" or maybe the "weekend warrior" dude from your home town, but the English language has a lot of very expressive words you can use to relay just about every kind of emotion needed other than dropping the "F-Bomb" every other word. It gets old, it's not as cool as you think, and if you are over 40, it makes a grown person look immature and foolish... besides unprofessional. Other vulgar talk or actions... just stop and grow up already. Yes, I know Elvis shook his hips and that was considered perverse. The Beatles had long hair and Kiss spit blood and blew stuff up. But I'm talking about being down right crude. Unless you are a group or entertainer and your whole show is based on being as perverse as possible, and you are advertised and marketed that way, then that's one thing. I won't go to your show anyway. But if you are a cover band and play everything from Elvis to Bruno Mars, and play places that cater to an age group from 30-year-olds to people in their '70s, dropping the F-bomb in-between "Blue Swede Shoes," "Margaritaville," and "Every Breath You Take" is just stupid and tacky. "Just don't do it if you want to be rehired!" A few times I have paid good money to see a favorite artist or band and they chose to not play their hit songs. They have a new "project" or whatever and play that instead. Maybe they throw in one song people know but it was not a hit and on the "B" side of the record or something. Being a musician and songwriter, I understand the need for playing something new and fresh. Also being a musician who has played cover songs or cover shows over the years, I understand how boring playing the same old songs over and over can be, especially if I didn't write them. If I had a dollar for every time I played "Margaritaville" and "Mustang Sally," I could buy a vintage, restored Mustang and have a life-time case of margaritas. I'd rather have a restored TA though and Whiskey. If you are lucky to be a signed artist with tons of hits that span over 40 years, and you are still playing and gigging and touring, Dudes & Dudettes, play your hit songs! Unless you advertise in advance that, in your tour or particular gig, you "ARE ONLY PLAYING NEW SONGS no Hits," then ok... but I bet you get half the turn out. If you are a cover band, and people like you enough to request songs, unless you don't know them or the requested song just does not fit your show and style you are advertised for, play it, even if you hate "Margaritaville." You are not a super-star and these days the local club scene is not what it once was, at least in my home town music scene. I feel you are lucky to be playing at all and not replaced with a DJ or Karaoke. "Just don't do it if you want to be rehired!" I don't care if you are famous; acting like an idiot or dork is not cool. Mostly if you are a local rock star, weekend warrior... if you have been playing covers in your hometown for 35 years, guess what? You're still in your home town. Be glad you can still do it and people still come! Don't be an egomaniac. Years ago my band in the mid '90s started shifting from the cover band scene to doing more of our own original music, doing our own original shows and opening for major headliners and top drawing regional bands. We had a CD, which we had produced with all original material. We were getting some local radio air play, CD's, and t-shirt sales at shows and music shops. 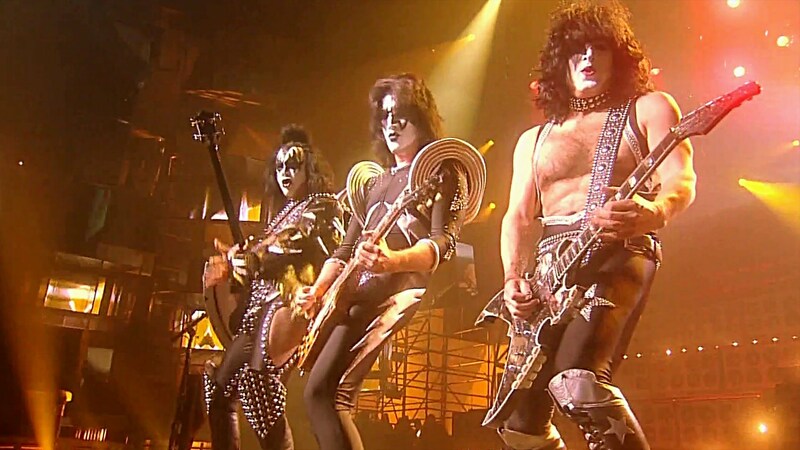 We were offered the opening slot for, at that time, one of the top Kiss tribute bands in the country. That was about the time Kiss did another farewell tour. So if you, as a Kiss fan wanted to get your "Kiss Fix," I guess you go see these guys. So here we are a local original band, with CDs and t-shirts, opening for a highly rated tribute band. They are late; their bus broke down on the toll-road. Their crew was there but the band was not. We did a great opening show, played our tunes... entertained the crowd and keep them satisfied until the band showed up. We finished our show and got our gear off the stage and out of the way as fast as we could. Now our dressing rooms are in the basement of this old theater where the show was. Strutter was next to ours. They show up angry, attitudes bigger than life... won't say two words to us. They won't acknowledge us at all. Once they put their makeup and monkey suits on, it got worse. Now they are Kiss—whooo hoooo look out. I really think they thought they were the real thing. So they did their show with mini-explosions and parody act of the real thing and at the end they still had egos bigger than life. I'm thinking, "Dudes... you are acting like idiots, treating us like garbage when we are an all-original band, in our home town, have gained a following, have a little air play, are selling merchandise in the lobby of the concert here, and what are you? The highest paid cover band in the world with mega-star-wannabe attitudes." Priceless! The point here is don't be rude and disrespect your opening act! Also talking smack about other musicians or your competition is not cool either. It just shows how small and unprofessional you really are. Music should not be a competition anyway! Disrespecting your fans and audience is un-cool too. "Just don't do it if you want to be rehired!" A lot can be said here. But it's quite simple. Having good gear is a yes. Having a great sound system and person, yes. Just use common sense and play at a volume that fits the hired situation you are in. Too many times I've played in bands that the attitude is, "I have to hear myself over you." And usually those bands do not play musically together and it becomes an audio power struggle for who will be the loudest point on the stage, which causes the sound production people headaches and club owners to get angry if their work staff cannot attend to customers properly because of volume or the people leave. "Just don't do it if you want to be rehired!" If you are playing the same songs & set list over and over for more than three months or longer, why would people want to come back, follow you around? Or why would club/bar owners hire you back? Most local bands don't venture too far from where they are from. Most won't drive beyond a 50 mile radius to venture out, which means most likely they try to re-book at the same places within their local areas more often if possible. It's easy to play the three local bars and a VWF and not have to drive far. With that said, I do understand that these days the band pay has gotten worse, not better! So yes, keeping the cost down, you usually stay locally centered. That's even more reason why you need to keep what you do fresh and different. If you are doing the same thing six months to a year from now? Well I guess coming to see you once a year is enough. A good cover band with seasoned musicians should be able to have 150 to 250 songs learned and ready to pull out at anytime. If you did, people could come every weekend for a month straight and hear something different. That means club owners make more money. They'll also have you back more often as you won't be boring and predictable. If the club owners are happy, you will be too. You'll make more and get re-booked more, as well as keep and gain more of a following. Your following will know that they won't be hearing the same old sets over and over, gig after gig, week after week. I understand if you are a singer-song writer "artist" type doing your own songs and you only have ten songs, you are going to repeat your songs. But it never hurts to pick a cover of a tune, make it cool and your own to add to your show and mix it up. As you write more songs, you will have a bigger set list to offer with some interesting and fun covers. Otherwise, "just don't do it if you want to be rehired!" "Just don't do it if you want to be rehired!" Good lord, it is the most easy thing to do, and important! I can't even tell you how many bands or artists I've seen and never caught what the band name was or who they are. I think a few times in Nashville I sat through two sets of a group and they never said who they were or where they were from. People, you've got the mic, talk! Tell us who you are. Where you are from. Where we can find you online and where you will be next. It is ok to introduce band members. This is the stuff that is fine to talk about between songs. If you are performing in a hopping bar, where people are coming and going all night, you don't know if they were there when the first set started and introduced. Say it as often as needed. Again, know your surroundings and audience and cater to it. "Just don't do it if you want to be rehired!" We all have had to take gigs that maybe we would have rather not have had to. But we have bills and they need to be paid. As long as it is a paid gig and it's safe, a gig is a gig whether it's a small neighborhood corner bar, big night club, or a graduation party. Treat it like it's your last gig. You never know who could be in that corner bar who may book you for something better. Remember life is short. If something happened and you couldn't play anymore or died, would you want to go out with an attitude that your last gig stunk? "Just don't do it if you want to be rehired!" 1. Don't cheat with the club owner/booking agent/venue's spouse.